AOL 'Up to 24Mbps Speed Broadband Boost' - The Scream! I'm at my parents house for Xmas and forgot just how terrible their AOL broadband internet is and have been trying anything to speed it up. I'm not sure (but doubt) if my current router (a crappy Belkin F6D4630) even supports ADSL2+. If it doesn't can you run an ADSL router on and ADSL2+ line, but where it defaults to a lower speed (thinking that otherwise if AOL do at some point switch it to a higher speed I've just killed my parents internet for a bit!). 3.73Mbps is not a bad speed if the line length is over 3.5km. At that sort of attenuation, you may be able to squeeze an extra 800kbps out of the connection by switching to ADSL2+ but on the other hand, this may be at the expense of stability. Firstly, find out the facts. If the house is distant from the exchange, there is no way you can expect high speeds. Find out how far the exchange is from their house. Log into the router and check the stats. The downstream attenuation should closely agree with the distance you found. If it is considerably higher or fluctuates, then you have an issue for sure. Much though I would love to blame AOhelL for a slow connection, they might actually be innocent. This is the time of year for Christmas lights and maybe a few extra people than normal using their TVs or whatever. First, find out what you should be getting and then compare it with what you are actually getting. What does "trying anything" mean? If you have been rebooting or re-syncing the router multiple times then this may have worked against you. Reboot the router only once per day (max 2) and in the middle of the day, e.g. before or after the lunch period. This should gain you the best sync speed. Sync does not equal throughput though. The line is profiled by DLM but this does not mean that AOL will instantly match that profile at their end. This could take up to 3 days. If DLM thinks the line is flapping, it will slow you down for stability. This action is quick, whereas reversing it is VERY slow (weeks - months). Placing an order for ADSL2+ is not likely to complete instantly. It will take 24-48 hours and may not be done at weekends. Please tread very carefully here as you may have made things worse for yourself than they would have been if you had simply accepted that 3.73Mbps is as good as it gets. That speed is adequate for viewing a YouTube video without buffering, for example. 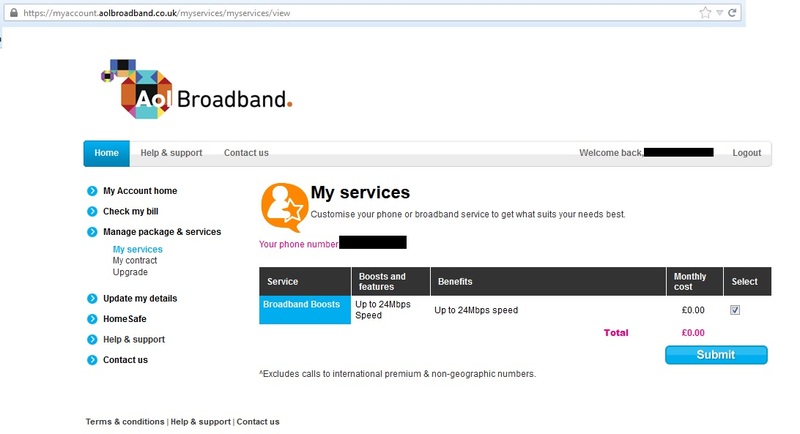 The follow-up may be useful to AOL/TalkTalk users who stumble across this page. tldr: Ring up tech support, say your router is old/broken (mine was a Speedtouch 580) and they may be nice and send you a new one for free.